Clitoria ternatea, commonly known as butterfly pea, Asian pigeonwings, bluebell vine, blue pea. 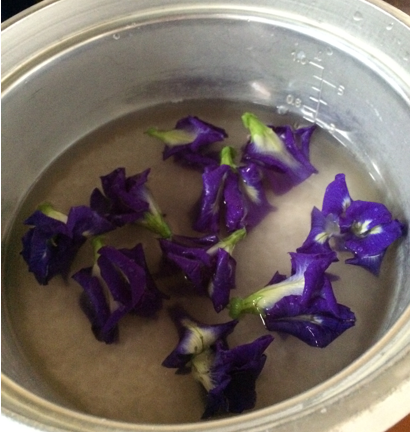 In Southeast Asia Butterfly Pea Flower is used as a natural food colouring. In Malay cooking, an aqueous extract is used to colour glutinous rice for kuih ketan (also known as pulut tai tai or pulut tekan in Peranakan/Nyonya cooking) and in nyonya chang. In Kelantan, east part of Malaysia, by adding a few buds of this flower in a pot while cooking white rice will add bluish tint on the rice which is served with other side dishes and such meal is called nasi kerabu. In Thailand, a syrupy blue drink is made called nam dok anchan (น้ำดอกอัญชัน), it is sometimes consumed with a drop of sweet lime juice to increase acidity and turn the juice into pink-purple. In Burmese and Thai cuisines, the flowers are also dipped in batter and fried.